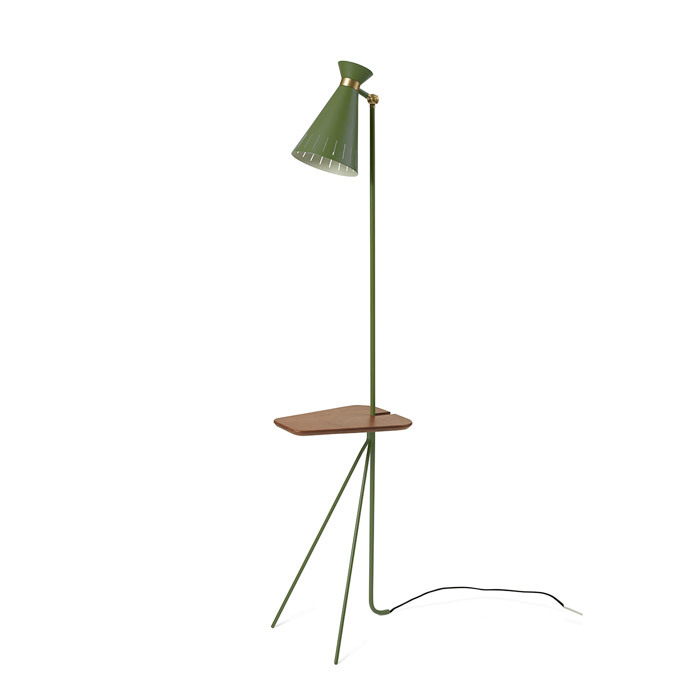 A classic floor lamp with a small, integrated, solid oak shelf table in an elegant 1950s design by the internationally renowned lighting designer, Svend Aage Holm-Sørensen. The shelf table on the Cone floor lamp is a charming period detail, which cries out for a cup of coffee, a drink or a mobile phone. 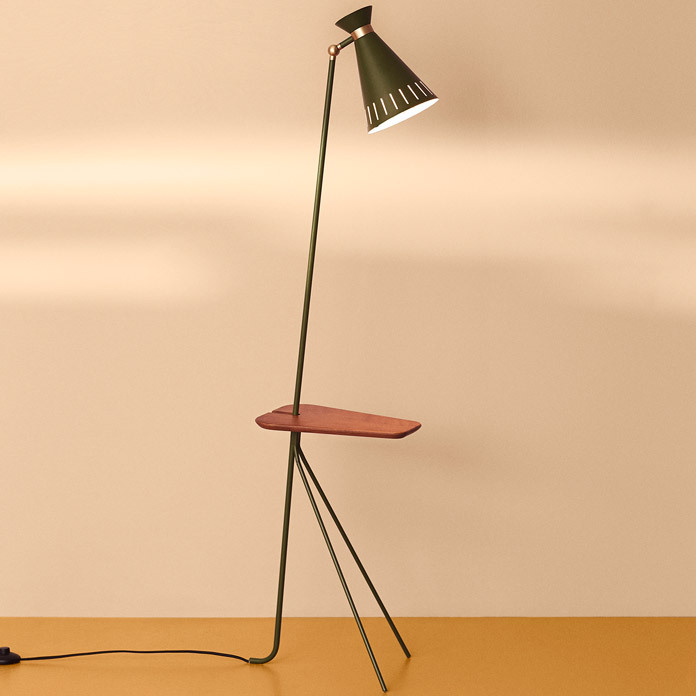 The lamp’s shade can be rotated in all directions to achieve light exactly where you want it. The design is lent even more character by the architect’s iconic light grooves along the edge of the metal shade, which also contribute to warm background lighting in a room. The solid brass details of the Cone floor lamp add the final touch to the classic look. Choose from several classic colours in Warm Nordic’s exclusive silky matt quality paint, which guarantees an extraordinarily beautiful and durable surface. The classic Cone lamps were originally designed in the 1950s by the Danish designer, Svend Aage Holm-Sørensen, who was a major pioneer in the world of Nordic lighting design. The floor lamp is part of a range, which also features a wall light and a pendant with the same classic shape of shade. Cone features exclusive materials and a classic, graphic idiom with the distinctive light grooves in the shade - Svend Aage Holm-Sørensen’s unique signature. The lamps capture the essence of an era, in which the grand master of Danish lighting design, together with architects and designers from all over the world, invested huge energy and passion in the art of lighting and created unique lighting designs. The Cone floor lamp has been specially selected for the Warm Nordic range as a tribute to iconic Nordic design that invests modern décor with invaluable diversity and depth. Svend Aage Holm-Sørensen sketched on everything: envelopes, theatre programmes, even tram tickets. Some remained sketches and ideas, but others he brought to life in the form of lamps. Thanks to a combination of imagination, talent and vision, Svend Aage Holm-Sørensen played an important role in Danish lamp design. From the 1950s onwards, Svend Aage Holm-Sørensen took the lead in the world of modern lighting during the heyday of Danish furniture design. As a licensed ornamental metalworker, Svend Aage Holm-Sørensen possessed an experimental, yet balanced understanding of materials, creating innovative, high quality lamps with an international, yet Nordic look. In consultation with Svend Aage Holm-Sørensen’s family, Warm Nordic is upholding the legacy of this great lighting designer and will regularly launch more House of Svend Aage Holm-Sørensen iconic lamp designs.